For months, the weather has been hovering at “Unseasonably High Degrees Fahrenheit” but last week’s spot of rain brought on a bout of spring fun fever along with the flowers. Here’s how to spring forward. Cultural History alert! This may come as a shock to some Go Go’ers but open mics are not a 21st century invention. …instead of just a destination for boy hair bands. Conceptually poised between Nashville’s historic Bluebird Cafe and Ronnie Mack’s legendary Barndance (where Block was house band drummer from 1987 to 1995), the Western Beat stage at the now-defunct Highland Grounds was graced by local and touring Americana acts ranging from Dave Alvin to Lucinda Williams to an unplugged Spinal Tap. On Thursday, the Los Angeles songwriter community gives back to Block who is undergoing aggressive treatment for Stage 4 metastatic melanoma. The Western Beat Special Edition Billy Block Family Fund Benefit will feature performances by over 30 of L.A.’s top songwriters including hosts/co-chairs Brad Parker and Ed Tree, Block’s band the Bum Steers, Stephen Bishop (On and On), Jack Tempchin (Peaceful Easy Feeling) and Wendy Waldman (Save the Best for Last). All funds will benefit Block. Hear great music; help a great guy. 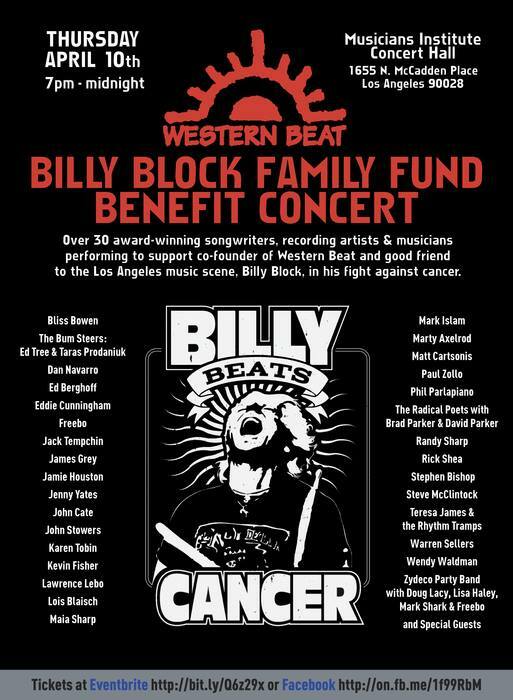 THE WESTERN BEAT SPECIAL EDITION BILLY BLOCK FAMILY FUND BENEFIT — Thurs, April 10, 7pm – midnight; $25 — Musicians Institute Concert Hall, 1655 N. McCadden Place, Hollywood 90028 For more info, go HERE. For tix, go HERE. More Mid-Week Go Go Fun!